Instant Pot Red Beans and Rice is an authentic New Orleans recipe that will be very popular at your next gathering or family dinner. 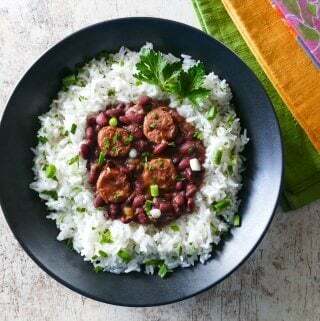 Made with andouille sausage and ham hock, this red beans and rice recipe is simple yet so flavorful! 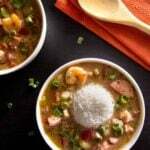 At the top of any New Orleans cuisine lover’s list would probably be Gumbo, Jambalaya and Red Beans and Rice. I’ve already posted Instant Pot recipes for the first two, so if you’re a fan of those recipes I think you’re going to love this Instant Pot Red Beans and Rice recipe. And if you haven’t yet checked out those recipes, you need to! 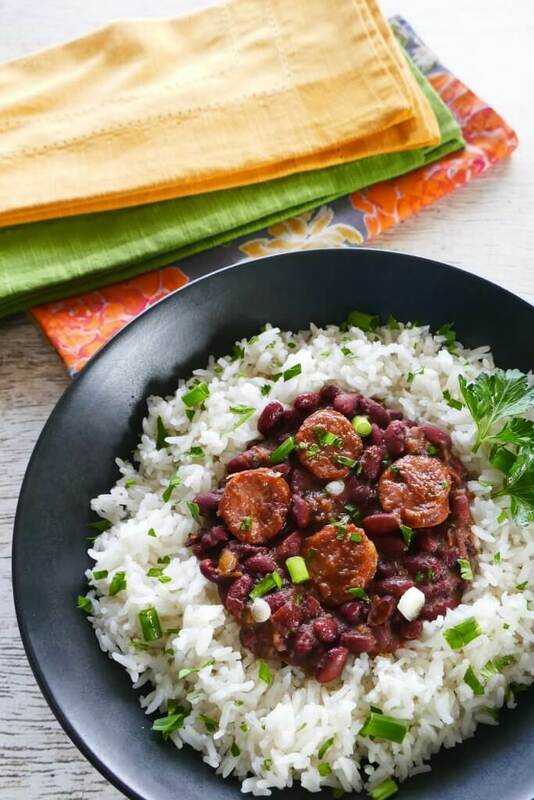 Red beans and rice was originally introduced to New Orleans by Haitians who arrived in Louisiana in the late 1700’s. In those days, not just in New Orleans but all over America, Monday was set aside as laundry day because it took all day to do the laundry! So to feed a hungry household, a large pot of red beans would simmer on the stove all day while the washing was being attended to. The ham bone left over from Sunday’s ham dinner would be added to the pot for extra flavor. To this day in New Orleans, red beans and rice is a staple on home and restaurant menus any day of the week, but especially on Mondays. 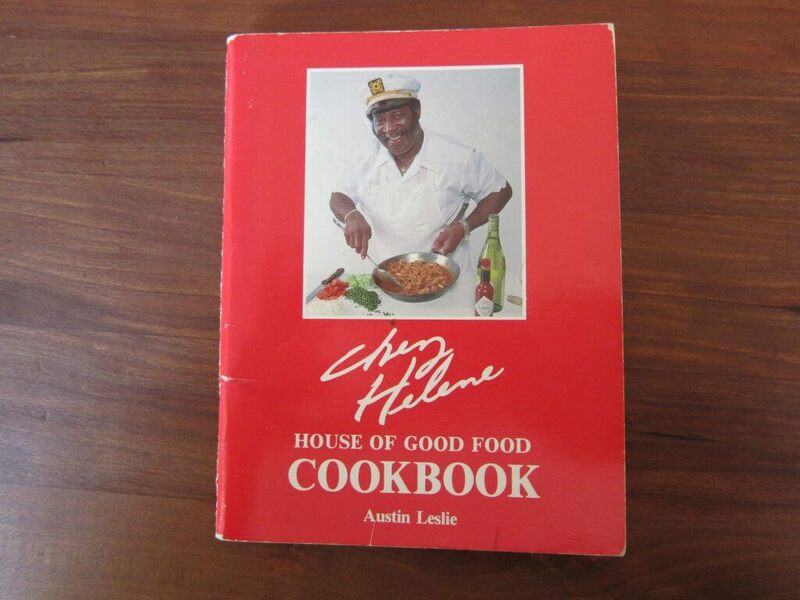 So I’ve mentioned before on my Instant Pot Jambalaya post that I have this little Chez Helene cookbook in my possession that has authentic New Orleans recipes. And I don’t remember where or when I got it! I’ve adapted this recipe from that book and am super pleased with the results. One of the things I changed from the original recipe is I omitted butter. The recipe calls for 1/2 stick of butter added after cooking – I think it’s really tasty without added butter – but if you wanted to add a small pat of butter over each serving, go right ahead! This easy Instant Pot Red Beans and Rice tastes as though you’ve cooked it for hours on the stovetop or in a slow cooker or crockpot. The individual ingredients are nothing special or exotic, but put together they make such a simple yet flavorful and comforting one-pot dish. It tastes great the next day, so feel free to make ahead. I’ve also included instructions for using dried beans if you don’t have the time to do pre-soaked beans. If you’re like me and you often forget to soak your beans overnight, have no fear! Use the Instant Pot Quick Soak method for dried beans and you’ll have the equivalent of soaked beans in about 30 minutes. Smoked ham hock or ham shank adds a delicious smoky flavor. It should be available in your grocery store meat case and is really worth seeking out. The original recipe from the cookbook also offers the option of using pickled pork, which I’ve never tried. Andouille (pronounced ‘ahn-doo-wee’) sausage is a spicy sausage. You can find it raw or smoked – you need to buy the smoked kind. If you can’t find smoked andouille sausage, substitute any smoked sausage and add some extra spice if you want to. The beans you use in this recipe are small red beans. These are different from red kidney beans. If you can’t find them in the dry beans aisle of your grocery store, try the Hispanic food section. If you still can’t locate them, use red kidney beans preferably Camellia brand red kidney beans. And no canned beans, please! You have a couple of choices for the spices: the recipe calls for cayenne pepper and salt. But you can substitute a Creole or Cajun seasoning for the cayenne and salt. I like to use Tony Chachere’s Creole Seasoning. You could also omit the spice and serve hot sauce on the side. 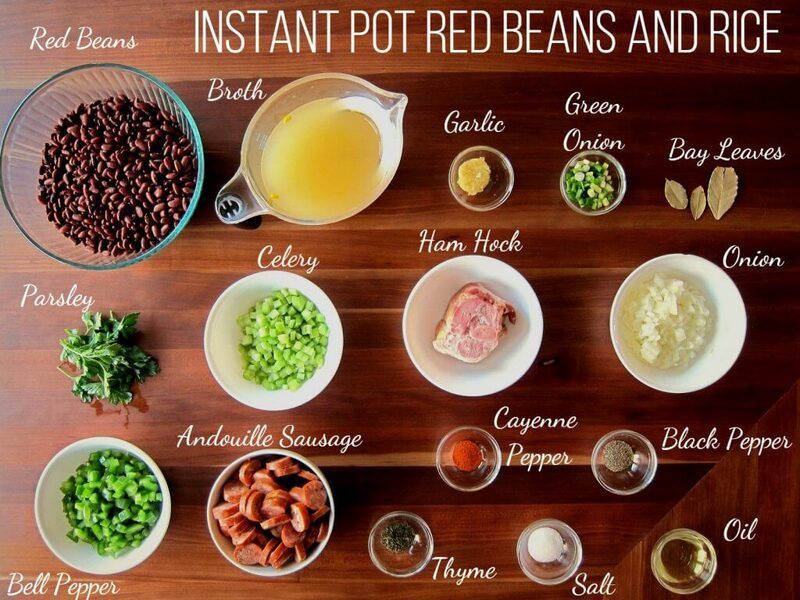 and aren’t familiar with how to use it, please read the Instant Pot DUO Beginner’s Quick Start Guide or the Instant Pot ULTRA Beginner’s Quick Start Guide first and then come back here to learn how to make this Instant Pot Red Beans and Rice. Soak the red beans overnight or use the Instant Pot Quick Soak Beans Method. Once the Instant Pot is hot, add vegetable oil to inner pot. Saute andouille sausage until browned (about 5 to 8 minutes). Remove sausage with a slotted spoon to a medium bowl and set aside. Add onion, bell pepper, celery and garlic to the inner pot. Saute vegetables till onion is translucent, about 5 minutes. Add thyme, cayenne, salt, black pepper and stir to coat, about 30 seconds. Add 1/4 cup of broth to deglaze, scraping up all brown bits. Add remaining broth, bay leaves, soaked small red beans and ham hock. Press ‘Manual’ (or ‘Pressure Cook’) and ‘+’ or ‘-‘ until display reads ‘30′ (30 minutes). Select Pressure Cook mode and adjust time to 30 minutes (00:30). Remove the ham hock and chop into bite-size pieces. Discard bone. Remove about 1 cup of beans to a small bowl and mash with a fork. Return chopped ham hock, mashed small red beans and sausage to the inner pot. Stir everything and cook in ‘Saute’ mode. Allow the Instant Pot Red Beans to thicken to desired consistency, about 5 minutes. Serve over Instant Pot Rice and garnish with chopped green onions and parsley. Instant Pot Red Beans and Rice is an authentic New Orleans recipe that will be very popular at your next gathering. It tastes as though you've cooked it for hours, and tastes even better the next day. Perfect for feeding a crowd, this recipe is so simple. I've given instructions for using dried beans if you don't have time to soak. 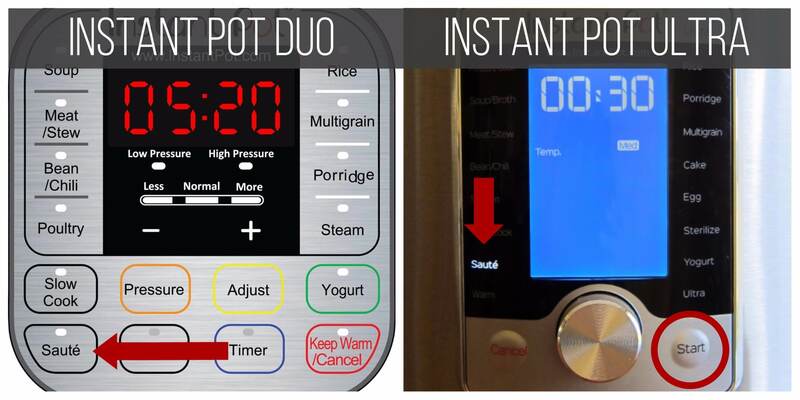 Select 'Saute' mode and allow the Instant Pot to heat up. Add oil to inner pot of Instant Pot. Add andouille sausage, and cook until browned, about 5 to 8 minutes. Remove with a slotted spoon to a medium bowl and set aside. Add onion, bell pepper, celery, and garlic. Stir until onion is translucent, about 5 minutes. Add thyme, cayenne pepper, salt, black pepper and stir to coat, about 30 seconds. Add a few tablespoons of broth to deglaze the inner pot, so there's nothing stuck to the bottom. Close the Instant Pot and pressure cook for 30 minutes. Remove 1 cup of beans, and mash with a fork. Return ham hock, mashed beans and reserved andouille sausage to the inner pot, and stir well. Select 'Saute' mode and allow the Instant Pot Red Beans to thicken, about 5 minutes. Serve over Instant Pot Rice and garnish with green onions and parsley. Serve hot sauce on the side (optional). Prep time does not include steps that are already accounted for in the ingredient list, e.g. chopped onions, minced garlic, sliced sausage, etc. 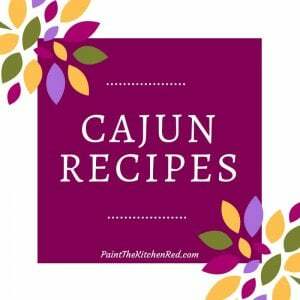 Substitute cayenne pepper and salt with Creole or Cajun seasoning, to taste. Excellent recipe! Tastes way better than the stuff out of the box. Love your site!! Next time I will probably up the ham hock from 1 to 3 because I didn’t get much meat off of 1, but it certainly imparted some flavor. Hi Bill – Awesome, so glad you liked it. I think you could definitely up the ham hock. I love the flavor! The Small red beans that U speak of for this Recipe, would that be the same a Pinto Beans that so may Mexican Recipes call for? Hi Richard, the small red beans are frequently found in the found in the Mexican/Latin section: labeled ‘small red beans’ or ‘frijoles rojos pequenos’ – Goya brand is common. You could use kidney beans but you’ll have to cook them for a bit longer. Thank you for visiting the blog – I too own a Presto from 20 years ago, still works. However, I haven’t touched it since I got the IP! I hope you enjoy your’s like I do! These were good. I live in New Orleans so I have my own seasoning but with standard well-soaked beans the cook time of 30 mins is spot on. I let them sit about 5 mins then released pressure. Then let them sit on sauté while I warmed the rice. They were just the way I like them! What a great comment from someone who lives in New Orleans – thank you for taking the time to comment and I’m so glad you liked the recipe! I love how thorough your instructions are! Thank you Gail – I know how confusing the Instant Pot can be for newcomers, so I try to always put detail in my posts! I made this last night and it was delicious. I wasn’t able to find the creole seasoning, but I did find Cajun seasoning and used that. I put in 1 teaspoon and 1/4 teaspoon cayenne pepper. I was also not able to find ham hocks, so I started with 3 slices of bacon, after the fat was rendered I took it out and browned the andouille sausage. I also added kielbasa so I browned it next. and followed the recipe the rest of the way as written. I took extra care to make sure the fond was all scrapped up with the vegetables. I had soaked the small red beans 12 hours in salted water. Came out great. I will be making this regularly. Alan, thank you for your comment and for letting us know your substitutions. I’m glad you loved the recipe as much as I do. Adjustments: I skipped the ham hock. I blended about two cups of the blender. I quick soaked the beans in the IP first. Results: Served with rice. Really delicious. Blending a portion of the beans really creates a richer experience. For those with kids, I thought the heat factor was perfect but my kids (5, 7) thought it was a bit too spicy and would have eaten more if it was less spicy. This may have been a result of the brand of sausage I used. Hi Wes, thanks for sharing your modifications. I think blending is a great idea; I can see how it would be really creamy. Yummy! I added a little more creole seasoning and blended the beans. Definitely a keeper. 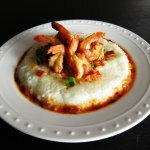 Thanks Bettina – I do like to add extra creole spice if my kids aren’t eating it 🙂 I’m happy to hear you like the recipe. Wow! From a Louisiana Cajun who’s lived in New Orleans, this was AWESOME! Thank you! It did. It need a thing added. We added corn bread and loved every bite! Woo hoo! Thank you so much for the kind words. I am so glad you liked it. Do u use high pressure or low pressure on the instapot? Hi Mimi – all my recipes are high pressure unless otherwise stated. That’s the case for most recipes you’ll find on the internet. Cooking instructions were perfect! I tweaked it a bit using my own traditional recipe (used a beer for part of the liquid). I ended up transferring it to a big pot on the stove to finish during the saute part, but that was only because I wanted to make rice in the instant pot. I also drained off some of the liquid, but that’s because I like RB really thick. Thank you Monica! I’ve never used beer in my Red Beans recipe before. I might try that next time! Do you ever blend some of the beans to thicken it? I’ve tried several recipes for red beans and rice (both slow cooked and pressure cooked), and made this one today – this is hands down my favorite! Used an extra ham hock (my grocery store sells them in packs of two), and added some creole seasoning, otherwise followed exactly. Perfect! I always say red beans and rice tastes better the second day, and this was better day one than anything else I’ve made on day two. If that makes sense. Already looking forward to the leftovers tomorrow! I’ve had someone else mention putting in more ham hock, and I say there’s no such thing as too much – love the flavor! Thank you, John, for such a glowing review of the recipe – you’ve made my day! This recipe is top notch!!! Absolutely delicious and authentic red beans and rice, the best I’ve had since my Cajun Pawpaw was alive. We followed the recipe exactly, but did the offered substitution of Cajun seasoning instead of cayenne pepper and salt. We also added dried chives and parsley during the pressure cooking portion, instead of adding fresh green onions and parsley at the end, and did dried red kidney beans instead of small red beans. My only note for this recipe is that I would not recommend leaving the skin from the ham hock in the mixture. The simmering process isn’t long enough to completely render the fat, so you end up with half-melted pieces if they’re not chopped small enough. use of the ham bone. Laura – awesome! I know it’s traditional to include a ham bone, but I’ve never done that. Great to know. Thank you for your detailed comment – I’m sure it will help someone else! I’m going to try this tomorrow. I’ve always done my rice, sausage, and beans stove top but now that I have an IP, why not use it? Two things… I’ve always used pinto beans rather than red beans. I’ve had it both ways. Not much difference, really. The best possible addition to this dish is your left over ham shank from Thanksgiving or Christmas. We leave the bone with a lot of meat on it and all that soft, chewy ham, and the sausage really kicks it up a notch! The ham will add some salt so go easy on adding salt to the pot. You can always add salt at the table. Note: Honey Baked hams don’t work well in this dish. Too sweet! A loaf of French bread or a pan of cornbread, some cold beer and you got yours real meal. Coincidence: I just had another reader comment about using a ham bone too! Thank you for sharing your tips and hope you enjoy the recipe! Yum! I love everything about this recipe. Very authentic! Came out great! 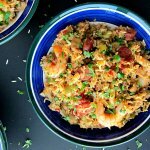 As much as I love Paul Prudhomme’s recipe, this Instant Pot recipe is now my go to recipe for rb&r. Needed around 20 minutes more total cooking time due to time to pressurize and depressurize. 5 stars! Thanks, Terence! I do love this recipe! I’ve made Paul Prudhomme’s recipe too – it’s good too. Francis, I have been in the mood to have me some RB&R too. I have some ham hocks in my freezer I need to take out tomorrow 🙂 Thank you for your comment! Best red beans and rice, from a lifelong Louisianan. I mainly looked at the recipe to see how long to cook the red beans in the IP. The 30 minutes cooking time was perfect. They were already so creamy when I took the lid off and stirred them I didn’t blend or mash any beans. The seasonings and veggies in this recipe are pretty close to what I normally use. This is a great recipe. Thank you! This is one of the best dishes I’ve ever prepared! It was absolutely delicious! I substituted smoked turkey tails (3) and turkey kielbasa for the pork, and even though I love pork I can’t imagine this dish tasting any better than it did. Thank you so much for sharing! I’m looking forward to trying more recipes from your site! Thanks for the comment, April. I’m so glad to hear you liked the recipe! Thanks for recipe. I do recommend you add that the you set it to high pressure. I had to scroll through to find your pictures and see what you did. There is more than one option for pressure and can make a difference in cooking. Other than that, it is awesome!!!! Stacy, I do mention the high pressure in my ‘About’ page but I think it’s time to state it on the recipes. I will put it on my to-do list to change my recipe cards when I’m updating the recipes. I’d never gotten that comment before but recently you’re not the first to suggest that. Thanks so much for taking the time to comment! It was easy to make and delicious. I made it exactly the way you laid out the recipe. This will be going into my rotation of recipes now. Thanks, Ross. One of my favorites too! I just got an instant pot and wanted to make red beans and rice. Your recipe sounded good, so I figured I would give it a shot. Not even kidding you, this is literally the most delicious thing I have ever made myself, and I typically consider myself a good cook. WOW. Will make a thousand times again. Thank you! Thank you, Jordan – that’s such a wonderful comment! I do love this recipe too. Amazing!!!! I am from the Mississippi Gulf Coast and this is a taste of home. Disaster! Beans were still hard after 30 mins so I added more liquid and processed for another 30. Beans still hard…liquid all absorbed. Scorched on the bottom. What a waste. I’ll stick to the stove top. Tallulah, I’m sorry you had a bad experience. I’ve made this recipe so many times as have many readers with no issues. Could the beans have been old? Old beans have a hard time cooking all the way. Did you soak the beans? Did you substitute any ingredients or change the recipe in any way? Was your Instant Pot sealed properly? These are just some possible issues. This was outstanding! We only had dried kidney beans so I used your IP quick soak @ 8 min. Then instead of S&P I subbed 2tsp of creole seasoning. Otherwise followed your recipe to a t, and it was awesome. Thank you!! Thank you Blaire! I love to sprinkle creole seasoning in there too! Oh my goodness! This is delicious. The ham hock taste is amazing! I used a little Moroccan spice in mine, which adds a little cumin and cinnamon sweetness. Thank you for posting the video, and photos. I am a visual person, and the Instapot can be intimidating. The photos were a great help. Tomorrow is the Mardi Gras potluck. I’m excited to have this sit overnight, so the flavors really meld, and to serve it tomorrow. I’m giddy to try more of your Instapot your recipes. Thank you so much! Thanks, Katy, for your comment! Yesss, overnight it gets even better! Enjoy your Mardi Gras get-together. If you like Moroccan spice, you’ll like my Instant Pot Vegetarian Moroccan Stew. You could add meat, but I promise you won’t miss it! Right on! I am a huge fan of the Moroccan spice blend. Most of my family are vegetarians, so I’ll definitely try it out. The overall response to the red beans and rice was pure joy! The flavor was incredible after melding overnight. Thank you so much for sharing your AWESOME knowledge and recipes! Excellent, hearty and satisfying. Kielbasa works as a good substitute for andouille. Moreover, I love his website for the detailed instructions provided for those who have the duo or the ultra models. My Instant Pot sat in its box for two months before I watched your video on how to get started. Now I use the appliance regularly. In fact, I have directed friends who don’t know how to use the Instant Pot to this website. Thank you Neena! Thank you, thank you – I so appreciate it when readers spread the word about my recipes! I’m so happy when I receive comments like yours because I love that I am able to help out new users of the Instant Pot. Hope you continue to enjoy cooking with it. OMG. I can’t say enough good things about this recipe. I’m still in the thickening stage of the recipe, but I’m jumping around my house in excitement because this recipe IS EVERYTHING. Definitely a new go to. Seriously people, make this ASAP!! Nicole, your comment brightened this rainy dreary day and brought a smile to my face 🙂 I appreciate you taking the time to comment and am so happy you liked the recipe!